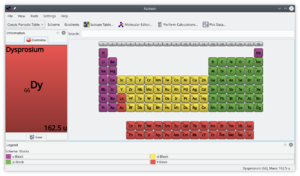 | '''Kalzium''' is an information system about periodic system of the chemical elements. It is part of the [http://edu.kde.org KDE Education Project]. '''Kalzium''' is an application which will show you some information about the periodic system of the elements. Therefore you could use it as an information database. '''Kalzium''' has already some nice features but there are still a lot of things to do. As '''Kalzium''' has been included in KDE 3.1 we are currently coding quite lot to bring in some new and nice features and make it as fast and usefull as possible. You can help us by testing it or make proposals for new features or a better design. '''Kalzium''' has already some nice features but there are still a lot of things to do. As '''Kalzium''' has been included in KDE 3.1 we are currently coding quite lot to bring in some new and nice features and make it as fast and useful as possible. You can help us by testing it or make proposals for new features or a better design. 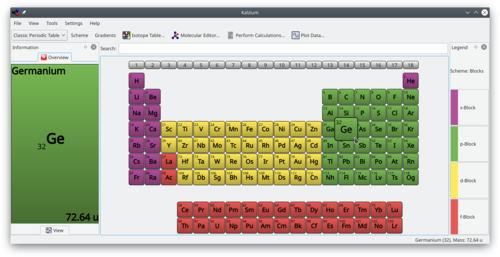 | The main window of '''Kalzium''' shows you the periodic table. You can choose between different color schemes. There are several chemistry-applications out there. A list of the ones we find especially useful can be found on the [[Kalzium/Other Chemistry-Applications | Other Chemistry-Applications page]]. There are several chemistry-applications out there. A list of the ones we find especially useful can be found on the [[Special:myLanguage/Kalzium/Other Chemistry-Applications | Other Chemistry-Applications page]].